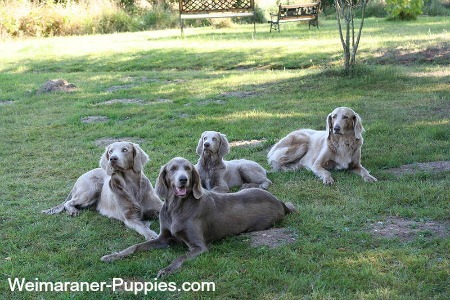 There are some good dog incontinence products on the market for Weimaraners who have loss of bladder control. Many are natural and do not have the side effects that drugs can have. Dog incontinence is a medical problem where urine leaks uncontrollably from your dog’s bladder. Incontinence is caused by the loss of bladder control, which happens for a number of different reasons. This urinary problem is often caused by endocrine disorders, congenital disorders, infectious diseases, tumors in the bladder, prostate, urethra, brain, spinal cord, or nerves, and trauma to the urethra, brain, spinal cord, or nerves, among others. While usually a problem in old age, we see canine incontinence in dogs of any age. Exasperating as it may be for you as the owner, this condition is also very stressful for your dog. Fortunately, the availability of dog incontinence products has been proven to be a great help for this urinary problem. 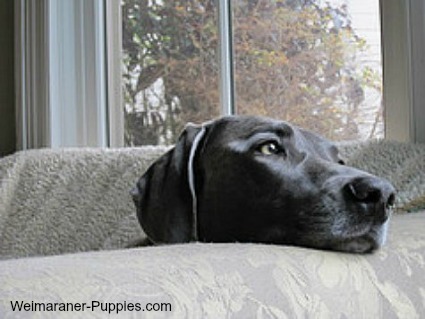 With dog incontinence, your dog may not be able to climb on furniture. The PetFusion Ultimate Dog Lounge was designed for incontinent dogs and is made to support old tired bones. Incontinent dogs often lose urine while sleeping, so it is important to address this issue. If you give your incontinent Weimaraner a nice place to sleep, you will cut down on accidents in other places. The mattress is memory foam, not egg crate foam. The cover is very durable and is water resistant and tear resistant. The Lounge cover is machine washable and easily removed and replaced. You can purchase extra covers separately, if you prefer to wash less often. 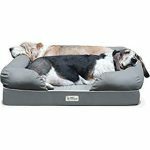 Dogs up to 100 pounds can use this bed. The bed is large enough for a Weimaraner. There is a 12 month warranty for this product. Even though you can take the bed cover off and wash it, I’d recommend using washable dog throws on top of the bed. This is a lot easier and gives you more flexibility. I’m suspicious that they are more absorbent than a bed cover, as well. Something you might want to consider is a waterproof throw for your incontinent dog. I find a throw to be quite versatile. You can use it on furniture, in the car, on carpeting, on a floor that you want to protect or on your dog’s bed or in his crate. The Teton Dog throw will help keep your house and car clean. 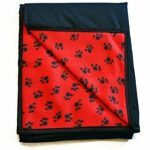 Using the dog throw on your dog’s bed makes it easier to keep her bed clean and fresh smelling. It’s waterproof. The waterproof lining is in the middle, so the blanket is reversible. The backing is NanoPore and can withstand the dirt and grime after a day playing in the outdoors. It will help keep your car clean and fresh. The back grips the surface it is placed on. With a heavy Weimaraner, blankets easily slide out of place. The fleece is a good quality and is non-pilling. The waterproofing is not just sprayed on (like Scotch Guard) – It won’t wear out. Easy care – you can wash this in hot water and then throw it in the dryer. Hot water kills more germs and gets laundry cleaner. Of course if you are traveling with your dog, or you just prefer a little convenience, you could get some disposable dog pads. Disposable dog pads come in handy for incontinent dogs. Disposable dog pads can be used in your dog’s crate or in the car in addition to locations near the door, on carpet or on your floor. 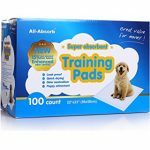 All Absorb dog pads are economical and seem to do the job as well as other higher priced pads. They have a quick drying surface. This prevents your dog from stepping in his pee and then tracking across your floor. Very absorbent. The pads will each absorb and hold 3 cups of water. They are 5 layers thick. Pads neutralize odors with baking soda. Even with the best laid plans, you will surely have an accident now and then. You would be wise to have a product on hand, to help you with the cleanup. Bubba’s Pet Stain and Odor Terminator will help you clean up accidental puddles. Bubba’s Pet Stain and Odor Terminator is a commercial product that will remove odors even from carpet or hardwood flooring. Its ingredients are natural and green, and they actually destroy stains and odor. They don’t just mask them. If you don’t love this product, you can get your money back. The manufacturer really believes in this product and they put their money where their mouths are. Multi-purpose – You can use Bubba’s to clean up auto grease, clean grass stains on clothing, as a pre-treatment for laundry, even in your cat’s litter box. 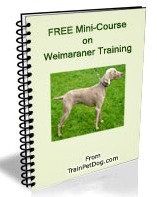 Using diapers on your incontinent Weimaraner will help keep the urine confined. The most economical way to do this is to use diapers that can be used over and over again. They are machine washable. 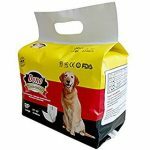 Diapers for dogs come in male and female types. You have to buy the right kind or they won’t fit right and cover the important parts. They can be worn without pads, but if your dog pees a lot in the house, you might want to use pads with them. 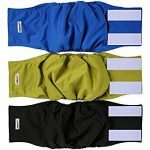 Soft inner layer which lays against your dog. It doesn’t crinkle or make noise, a problem for some dogs. Velcro closures. They don’t stick to fur like adhesive closures do. Because male dogs’ anatomy is a bit different from the girls, they need a different design for their reusable diapers. The highly absorbent pad is sewn into the diaper. There is a pocket that you can use for extra disposable pads, if your dog is a heavy pee-er. 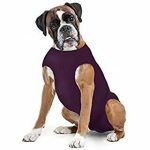 Soft comfortable jersey fabric on the inside, so it’s comfortable for your dog. No crinkles or noises when he moves. The fabric wicks most of the moisture away from your dog. This is quite a dapper diaper holder and it can be used with either a male or female dog. Keeps the disposable diaper in place. If you have a dog that likes to wiggle out of things, this is an important feature to consider. Invented by a veterinarian and used by vets and universities all over U.S.
Vets Best disposable female diapers are throw-away, just like disposable baby diapers. Designed with a comfort fit in mind. A leak barrier keeps pee where you want it. The diaper is adjustable for a better fit. 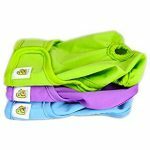 DONO Disposable Male Dog Diapers are my choice for male dog diapers for travel and convenience. They have a wetness indicator. It changes to a dark green color when it is time to change the diaper. Magic tape keeps the diaper fastened. This is important if your dog dislikes wearing a diaper and tries to remove them. The company has a 30 day guarantee, assuring that you’ll like the diaper or you get your money back. 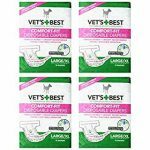 Each of these dog incontinence products has a place in your dog’s life if you are having trouble with involuntary peeing. I’m hoping that this information will help you to choose what you need for your dog. Treatment of dogs with incontinence normally depends on his age and the reasons for his incontinence. The treatment may be simple or you may need the help of a veterinarian. Once your pet has been diagnosed to have canine incontinence, you may find that natural treatments help your dog control her urine and keep her comfortable, without side effects. Saw Palmetto – is used to treat prostate cancer in human males. It will also work to treat your dog’s loss of bladder control. It can even reduce your dog’s risk for prostate cancer. Pumpkin seeds – Pumpkin seeds and oil strengthen the bladder muscles, balances hormonal levels, and naturally cleanses your dog’s urinary tract. Ooleuropein – an olive leaf extract is useful for dog urinary problems by being antimicrobial in nature. Cranberries – also prevent bacteria from penetrating the lining of the bladder. Cranberry juice is often prescribed for people (especially pregnant women) to get rid of bladder infections. Cornsilk – is an herb commonly utilized to treat dogs with incontinence. It supports urinary muscle control and quicker emptying of the bladder. Adjusting your dog’s diet may also prevent loss of bladder control. Fresh foods and raw vegetables have been known to improve a dog’s condition and have also shown to be successful in treating dog incontinence. However sometimes, especially with senior dogs, there is no magic bullet. Your dog is older, and simply is incontinent. Dog incontinence is more or less a lifelong condition for them. So it is necessary that you treat your dog with kindness and understanding when she does lose control of her bladder. She’s possibly just as mortified as you. Sometimes people elect to put their incontinent dog to sleep. But you don’t have to do that. However you don’t have to put up with a smelly, germy home with urine all over the floors and furniture. The first thing you can do indoors is confine your dog to an area where the floor is easy to wipe clean. Avoid wood floors, as they absorb odors and are very hard to remove the odors and get clean after they have been soiled. A product like Bubba’s can help here. Next, take your dog outside for frequent walks. In warmer months or climates, let your dog spend much of the day in a fenced in yard. If she pees outside, it won’t be inside your house or apartment. Last, you may need to give your dog more frequent baths, to keep her smelling fresh. Make sure you use a gentle and soothing dog shampoo.